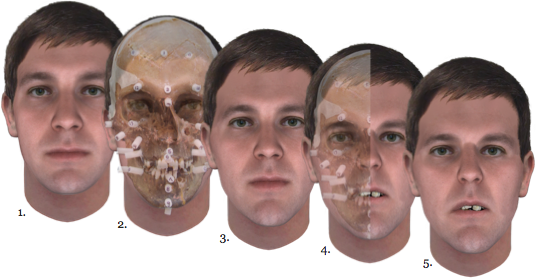 Stages of a Snapshot Facial Reconstruction: (1) a Snapshot composite produced from DNA extracted from the subject's bone; (2) Snapshot composite with skull overlay; (3) Snapshot composite after rescaling to conform to skull dimensions; (4) a cutaway image illustrating near final composite; and (5) final, blended Snapshot composite. Snapshot phenotyping algorithms are used to predict a decedent's appearance and ancestry using DNA extracted from bone. Independently, a traditional facial reconstruction is performed by a forensic artist who has been specifically trained to interpret Snapshot DNA Phenotyping results. Tissue depth markers are physically applied to the decedent's skull, based on DNA-determined ancestry and estimated body weight, to produce a prediction of face shape from cranial morphology. A final composite is then produced by digitally blending the two predictions. 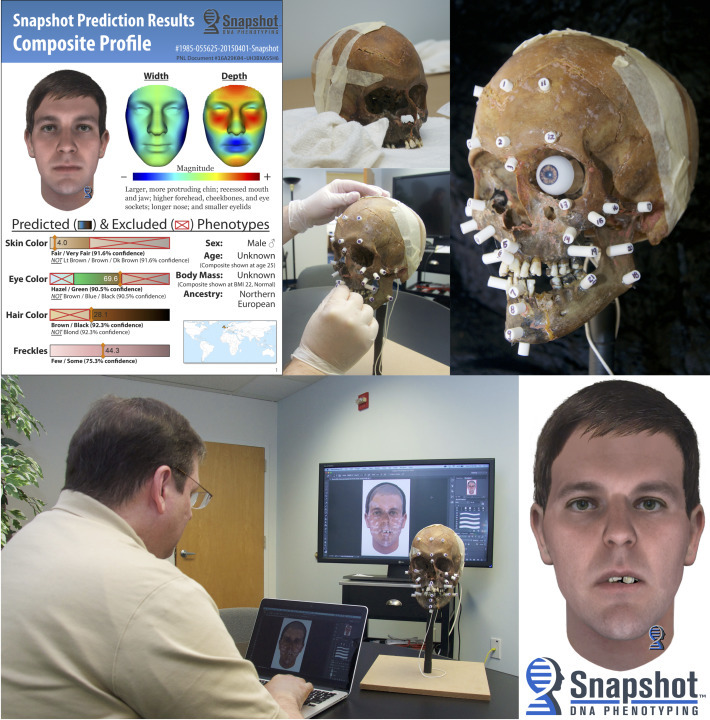 Thom Shaw, an IAI-certified forensic artist at Parabon NanoLabs, performing a physical facial reconstruction and the digital adaptation of a Snapshot composite to reflect details gleaned from the victim's facial morphology. 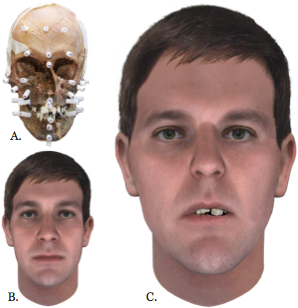 When the evidence for a case includes the victim's skull (A), it may be possible to perform forensic facial reconstruction to further enhance the Snapshot prediction (B), resulting in the final blended Snapshot composite (C).